cat eyes & skinny jeans: Time to 'Watch' Time Squared! Lovers, “you’re late, you’re late…for a very important date!” And what, pray tell, is this très important tête-à-tête, you ask? Don’t be daft, darlings; it’s the chance for you to experience the wonderment that is time2 and it’s corresponding time2 blog! Time2 (that is, of course, short for Time Squared) is a veritable smorgasbord of information about upcoming events involving tantalizing timepieces, in addition to being a one-stop shop for the watch lover within. A charming online locale where you can purchase pretty Juicy Couture gems, then learn of exciting events involving your new splurge du jour. 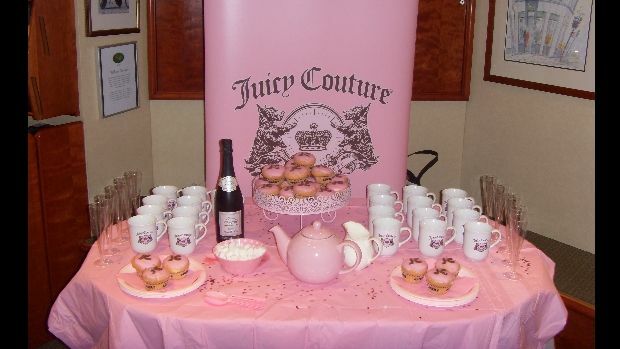 For instance, had you recently paid them a visit, you would have been aware of the fact that just yesterday, Selfridges hosted a Juicy Couture Tea Party - complete with tea, cupcakes, and bubbly - smack dab in the middle of the fashion watch department! But I digress, my darlings. The future is now; and while you may have missed yesterday’s ultra-fabulous Juicy Couture Tea Party, time2 blog is here to ensure that you are kept in-the-know about everything involving wrist-wear – from the Tea Party that Chopard will be launching next week in the Selfridges Wonder Room to showcase their new Temptations collection, to the top watch styles for the fall season to see you through autumn in true sassy style. Now…don’t dawdle, dolls! Off you go to time2. And while you’re there, don’t forget to pick me up a prezzie or two; you do know how I can never resist a beautiful bauble! Thanks to time2 blog for the picture. So love the pink tea-pot! This is so you! I would so love to go with you. You make everything so magical and fun. Time2 sounds so fabulous, like really fabulous. I love Time2. They do the most wonderful items.